having a beer and have it happen in front of you, even though I know their bike I just didn't connect, it was all a bit surreal and I needed to write about it. That's okay you can ask and the answer is No! Coffee was all that they had had. Police attended and seemed satisfied that it was just a silly accident. Gosh, I hope I don't provoke a flame war!! But if it saves some pain, then perhaps it will be worth it. We went to see her tonight. She had her left knee cap filed and her right knee cap actually had bone shaved off it. They tried to get her out of bed today but the pain was too bad. Her right leg is so swollen. There wasn't enough skin to close the wound across her right knee. She was cheery enough but rang for pain killers whilst we were there - I have that effect on some people. She also broke her right little finger, I said I might have done that because I was holding her hand rather hard. She just laughed and said no, probably grabbing at the indicator did that. As she was falling she said she saw the mufflers in front of her and tried to grab them, luckily she didn't make contact, but she did grab the right rear indicator and broke it! She also has a broken rib, but she didn't even notice those two things because of her knees. hmmm... makes you think about your last ride. Geeze The Boss and I went for a quiet ride in the hills on Sunday.. Her first trip up there as pilot. I wasn't going to be playing so I just wore jeans. She is still looking for leathers and also only wearing jeans. To be honest I think the girl in the story had become complacent, I know when I don't wear my play gear I am very aware of what I'm doing and take more care. We can't assume that for our pillions though. I'm looking for a two piece zip up suit and kinda have been for a while now, I watched a bloke dump his bike in front of me early this year, then roll along with the road pulling his pants down.. and his jacket up. He had leather jacket and leather pants but they didn't connect. Ugly from TOO many aspects. haha.. Haven't been out too many times this year so priorities have been different. >M9, I'm really sorry to read of your loss. The ONLY good anti theft device is good insurance..
For the record, it was a 'loaner bike' from the dealer while mine was in being serviced. I also have full insurance for my bike, .. but honestly would find it minor consolation if mine was stolen and not recovered, compared to the inconvenience of not having the bike, and also having to obtain a suitable replacement. Just a warning to all who ride motorbikes here. The TAC in their wisdom have come up with a new policy for their compensation payouts for motorcycle accidents, if they deem that you were not wearing "appropriate" safety gear then even if the accident was not your fault they will deem that you have contributed to your own injuries and will reduce your compensation. Now i do wear all the gear all the time, but what is considered appropriate? and who decides.There are only Australian standards for helmets and CE armour so there needs to be a clear list that we can access to find out if we are "legal". Also does this mean if your car does not have airbags or only has a 3* safety rating that you will have less compensation coming our way. I think we need too find out some answers to these i will be asking soon. Keep you posted. Recovering from a transport accident can be a very emotional and challenging time. It’s important that you get the right treatment, support and information to help you move on with your life as soon as possible. This section has information on what you can expect from the TAC and the support services the TAC pays for. European Standards (EU ~ particularly EN13595) seems to be their most often quoted performance criteria from their own protective clothing link. Australian Standard AS 1698 for helmets. My rego renewal came the other day and with it a brochure indicating how the levy is being spent. I need to read it (at home), but from a glance it seemed that tarring vehicle pull-offs so that debri doesn't come onto the road (when cars re-enter), making corners unsafe, was their main item. 114 m/cycle blackspots treated to date and further sites identified through funded research. M/cycle friendly roundabout trial involving flexible signage and roadside furniture. Roadside m/cycle friendly barrier trial at 9 locations. Training of 'authorities' that work with/on roads re m/cyclists extra 'safety needs'. Training for m/cycle novices and returning riders, as well as public awareness campaigns for awareness. Implementing a 'star rating' for m/cycle safety clothing/equipment. Thought I'd shop around to see if I could get a better rate, and was stunned to see variance of almost 100% for the same cover between about five different service providers. Ended up staying with the one I was already with, but used the new found information to leverage them to a higher 'agreed value', as in my opinion they underestimated it badly, simply due to applying a set depreciation formula. VicRoads have asked UltraFeedback to help them better understand motorcycle rider and car driver attitudes toward each other, and how this influences motorcyclist crash risk. You previously indicated that you would like to participate in motorcycling-related research, so we would now like to invite you to complete this 10-15 minute survey. Your feedback will help make Victorian roads safer for motorcyclists. You can also go into the draw to win 1 of 2 gift vouchers valued at $250 each. Every entrant will have a 1 in 500 chance to win. Please note that your responses will remain completely anonymous - no individual will be identified to VicRoads or any other organisation. We also WILL NOT give your contact details to any third party. If you know of any other motorcyclists who would like to complete the survey, please ask them to contact me and we will send them their own login details (do not simply forward the link above - this is YOUR unique login). This research complies with the AMSRS code of ethics. It is one way of giving feedback to VicRoads. Amongst other things, there were a few questions in it relating to lane splitting. Also stoked (yes, wrong thread I know, but it is off-topic ☺), to finally track down the Australian source of Twist of the Wrist books by Keith Code after looking sporadically for a while without success, however did find quite a lot of interesting/relevant stuff on the internet over that time. It is pretty amazing what educational material comes in Vimeo/YouTube/etc these days. Interesting too, that a lot of it seems to be pommie based! I just sold my bike ('08 Suzuki Boulevard c50). I use Shannons for everything insurance. I had to shop around after i brought my clubsport because my insurer at the time wouldnt touch it. But im stoked i did! With the bike i had agreed value for the purchase price, new for old replacement in the first 2yrs and it was less than half of what RACV tried to charge (over 1000!!!). My other joy is bikes, hence my post here. I used to race a bit at club level back in Aus - too old/scared/crap to try racing here, but my daily commute-scoot is a KTM 950SM - just a joy to ride. Perfect urban weapon for Tokyo, and pretty damn fine for longer runs too. I recently did a trip to Ogawayama for camping / climbing on the bike and it was perfect - a 200km run to the mountains, a weekend climbing, and a fast run back afterwards. I need to sort out some hard/soft luggage rather than carrying stuff in a backpack, and it will be ideal. Only problem with biking here is the traffic - truly hideous, freeway traffic jams are measured in 10s of kilometers, and I recently was stuck in one 87km long (in a car) and took 8 hours to do 140km. Better on the bike, but you have to get used to high-speed lane splitting if you are going to make progress - far more hazardous than the actual climbing, but you do it anyway to avoid terminal boredom. Anyway, hi, I'm looking forward to meeting some of you around some of the Aus climbing areas when I get back next year. You may be interested in contacting Tokyo Bill, an Aussie(?) climber in Tokyo if you are looking for a climbing partner. ~> Definitely a sweet ride by all accounts, though good skill would be needed to get the most out of such a potent machine! They look fun. I checked one out when they came out, due already having a KTM 950 Adventure. Knowing how hard the seat on mine is, I reckon yours would take some getting used to for longer trips; ... though if you are playing aggressively in the traffic it would become unnoticeable due other considerations! If you get the time and the inclination, please post up trip reports of your adventures over there, as I am sure I wouldn't be the only one interested! Sure, I'll put together some pics and words on Tokyo climbing when I get some time. Yes, the 950SM is a ball to ride - but very very accessible. It is incredibly easy to ride, and if you are relaxed with the throttle, it is a very gentle unthreatening ride. Combined with the best riding position of any bike I've ridden, it is a great commuter. But when you feel like upping the ante a little, it gets very exciting very fast :-) I find the seat very comfortable (suprisingly so, it doesn't LOOK comfy) up to about 500km days, which is about all I'm really up for anyway. Without looking at specs, I'd say it is the same engine (LC8), but with slightly different gearing. A good strong, and relatively flat (no peak and drop-off), powerrrrr curve, ~> nice and predictable! ... ~> always good for mileage with that one! Just tell him he is getting memory loss and forgetting his age if he is climbing stronger than you!! >Beautiful. Post a pic when you finish doing her up. ~> It looks a great result! 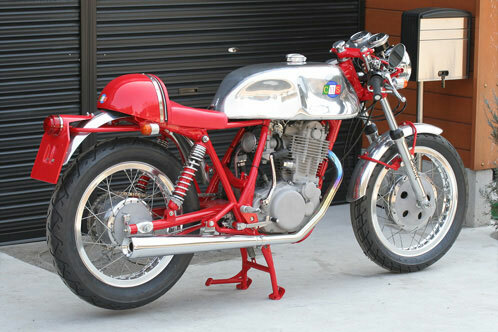 There are a LOT of SR400s here in Tokyo, and they are probably the most common bike used as a base for custom bikes - so you see a lot of "Japlish" customs here, from smart showbikes like this one, through racing versions, to really cool rat-bikes. to be more specific... M9 is talking about the "Deus premium"
Thats almost HALF! Deus make amazing bikes... and i'm not for a second implying that the quality of my work matches theirs... they are world class.... WORLD class. Got my new Bike last Tuesday a 2009 Buell 1125CR, sweet V-twin engine made by rotax in a funky great chassis.